I woke up today thinking I would fess up to my lack of finishing my Q1 FAL list. We all have until Saturday at 11 pm EST to add any last minute finishes, but as of today, it's a total bust. I do have one project from my Q1 list that I could easily finish in time, that one. 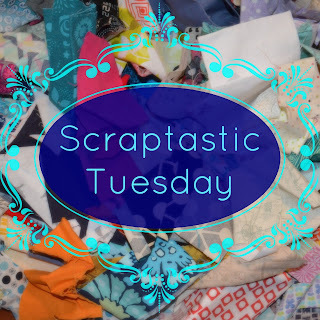 I have finally decided on the scrappy, all the colours, binding you see in this photo, so maybe tonight I can sew it on, then handstitch the binding down with a movie or something on Friday night, photos on Saturday morning, and post it to the finishes link up Saturday afternoon - totally doable right? And finally, start thinking of your Q2 list of projects to finish as the link up for the Q2 lists opens on April 2. I had time to quilt this weekend so I did. This quickly taken not great photo is where I finished on Sunday. The quilt is about 60" square and is made from the small blocks that my friends in my Bee Sewcial bee swapped last spring. The negative space - or background - is yarn dyed Essex linen (55% linen, 45% cotton) in shale. I am trying to decide on the binding. I have sufficient Essex linen to bind it to match, thus making the binding disappear. However, I also wondered about a scrappy binding using solids that basically match the pops of colour in the quilt. I am not sure if the colourful binding makes the blocks pop more or if it would steal the show. So I'm going to think about it for a bit. I decided early on that I would quilt this quilt with mainly an all over topograaqwsxç phical map, contour line type quilting. The quilt is made from swap blocks from all over Canada and the USA so the quilting represents the land between the friends so to speak. I quilted it about 1/4" to 1/3" between the lines so it is fairly dense. This motif has become a new favourite, it is fast and easy to do, more interesting that a stipple, relaxing, and very interesting looking when done. For me, it is easier to make this kind of curves than swirls, maybe because my brain does not see them as curves but as a map and I like maps? I am eager to see how it looks when it is washed and dried. For the medallion, I planned and quilted matchstick quilting, to bring the friends together. I matchstick quilt free hand on my APQS Millennium Long Arm Machine, without rulers, channel locks or computer. Given the nature of the frame, one can make long long lines horizontally but the length of vertical lines is limited to the throat space for the most part. 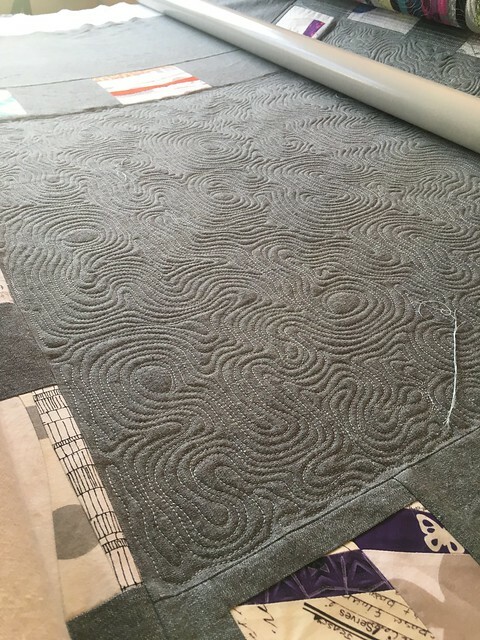 So I left the vertical sides unquilted and when the rest of the quilt was quilted I took it off the frame and reloaded it after a quarter turn. I did spend a few minutes making sure that the medallion part was lined up nicely but otherwise it was faster to turn than I expected. Adding the quilting went off without a hitch too. I used a light blue variegated 100% cotton King Tut Superior thread for this quilt. 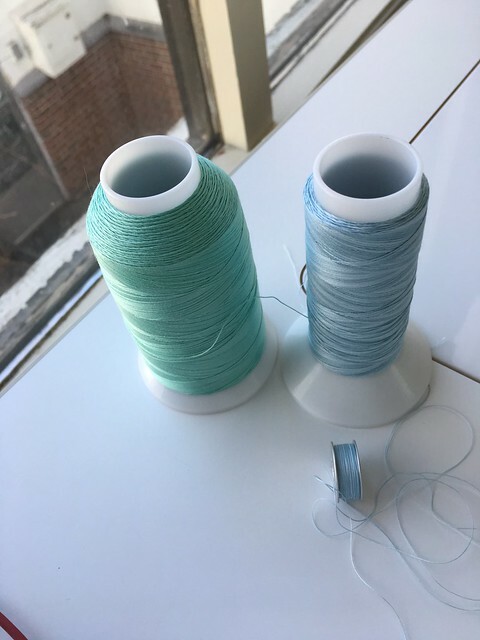 I matched the thread to the weft of the yarn dyed Essex Linen. 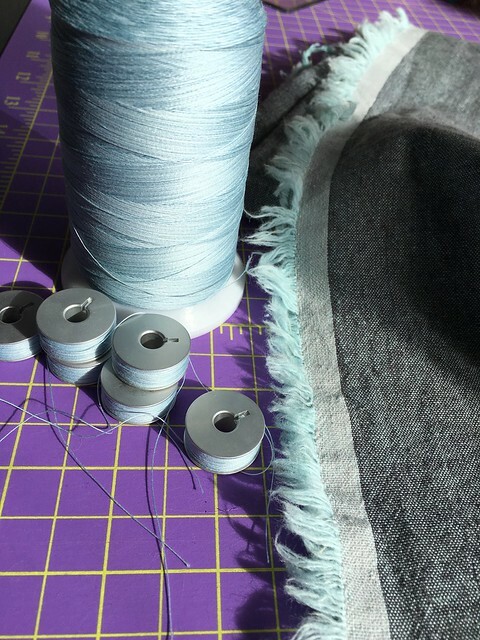 In the end, I used 20 and a bit bobbins, the remaining thread is in this photo. I also used most of the 2000 yard spool - almost 2 kms, or just over 1 mile. It was a lot of quilting I guess. 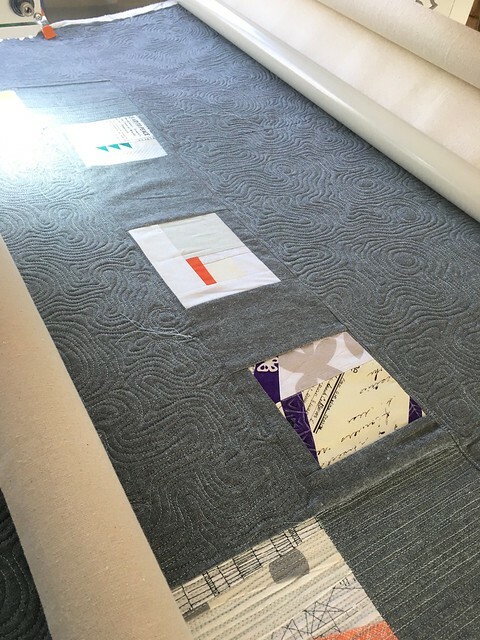 If you are interested in more quilting photos, I shared several on instagram. I am hoping to decide on and finish the binding this week and also mend in those thread ends you can see in the first photo. 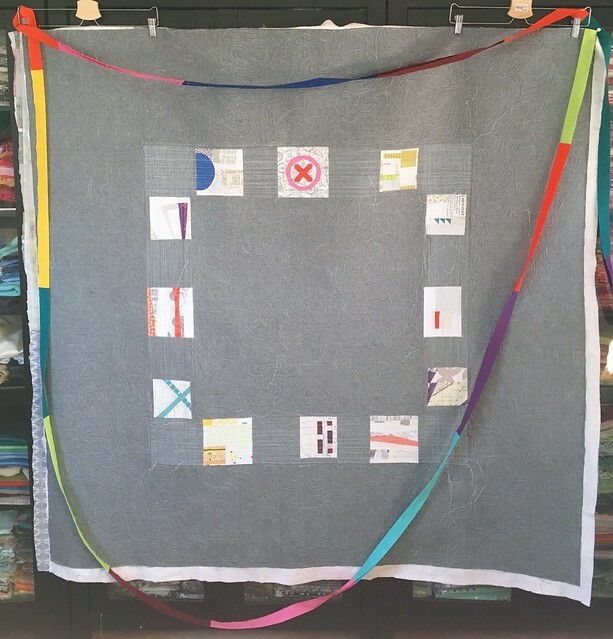 This quilt is on my Q1 2017 FAL list and the end of the quarter is fast approaching. Hello, my name is Abigail and I blog here at cut&alter. Back in November I was surprised and delighted to open an email from Rhonda inviting me to become one of the global host of the 2017 Finish-A-Long. There are 13 of us in all and over the course of the year we'll be introducing ourselves.Nicky from Mrs Sew and Sow started off in January followed by Jess from Elven Garden Quilts in February and now in March it's my turn. I found the FAL late on in 2015 and couldn't believe how it motivated me to get things finished. I have always been a list maker and the FAL is no exception. My lists are somewhat larger then most people's, although I have certainly seen longer as well! I know that I will never get everything ticked off within the current Quarter but it does give me 1) accountability 2) a reason to tidy up and reorganise my studio each quarter to find those projects which have been languishing on shelves and at the bottom of boxes 3) it brings projects to the front of my mind and a lot of work goes on in my mind even before I get in the studio 4) if a project has been rolled over just one too many times I can then see that it's probably never going to get finished and I can pass it on (does that count as a finish?!!). Last quarter I had a particularly low completion rate and this one is shaping up to be the same but I have a few finishes and some projects are considerably further on! I live in Stratford upon Avon, in the United Kingdom, with my husband, who is from New Zealand, our two daughters and a black and white cat. We have been back in the UK for just over 4 years and prior to that we lived in Otaki, New Zealand. We have been called gypsies before now due to our constant moving, and usually not within the same area. This is the longest time I have ever lived anywhere! (Can you keep a secret? Maybe, just maybe, my feet are itching again!) Some of the other places I have lived are: Nottingham, Leamington Spa, Sydney, Wellington, London, Waihi Beach, Cambridge, Tauranga, Rowington, Shirley, Waitarere Beach and Feilding. The whole idea of living here (the UK) or there (NZ) was the inspiration for this quilt. I was delighted when Should I Stay or Should I Go? was awarded Best Piecing in Show last November in Bristol!